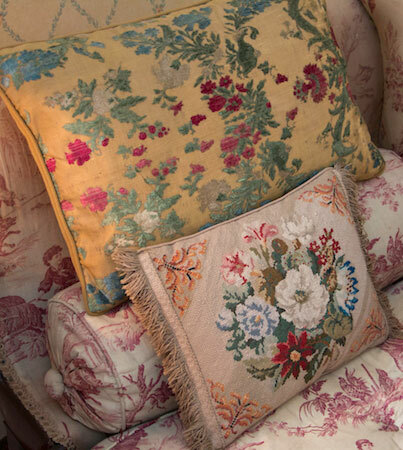 Ready for a virtual needlework tour of Arlington Court? This stately home has been owned by the Chichester family since the 14th Century. You may have heard of Sir Francis Chichester, the yatchtsman famous for being the first person to sail single-handed around the world in 1960. 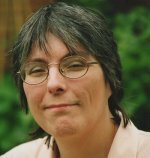 The house and grounds were bequeathed to the National Trust in 1949 by Miss Rosalie Chichester. As National Trust members visiting Barnstable in Devon, on our recent vacation, we decided to pay Arlington Court a visit. 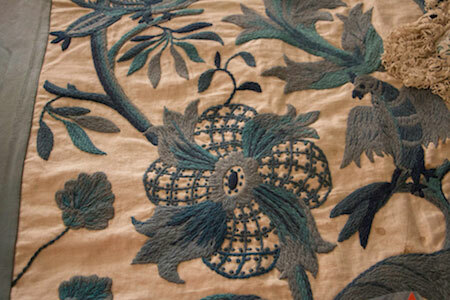 I was keen to look at any needlework and textiles on display. Before we move on, I must say that I was permitted to take photos of the following items as long as I didn't use flash. 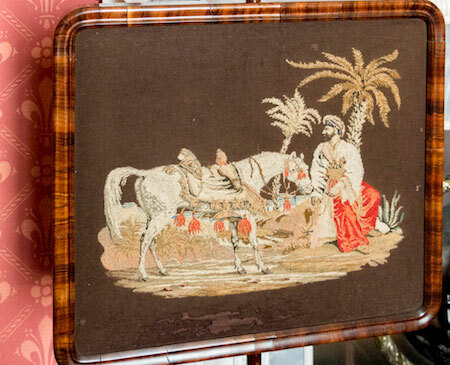 The first piece of needlework I spotted downstairs was this exquisite pole screen depicting a white Arab horse. The stitches were TINY. I wouldn't be surprised if the canvas count was as high as 50 threads to the inch! 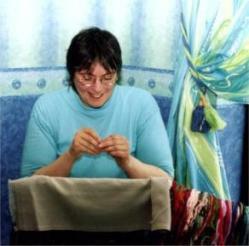 The work was carried out in tent stitch or petit point as it is also known. 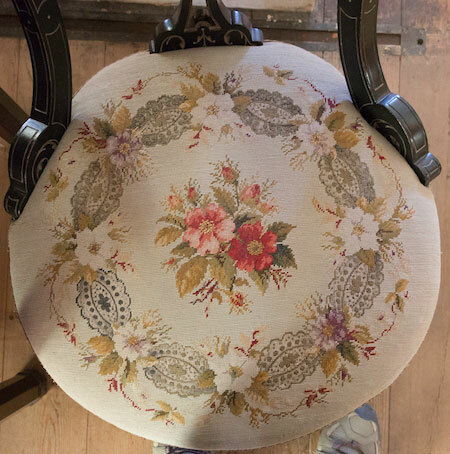 Next was a floral chair seat cover also worked in needlepoint Although still small, the canvas count was not quite so fine as the picture above. I was impressed at how bright the colours still were in this piece. 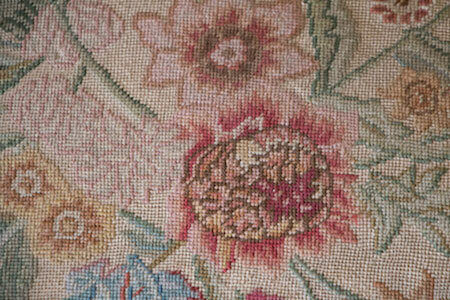 On the first floor there was more beautiful needlework to see. 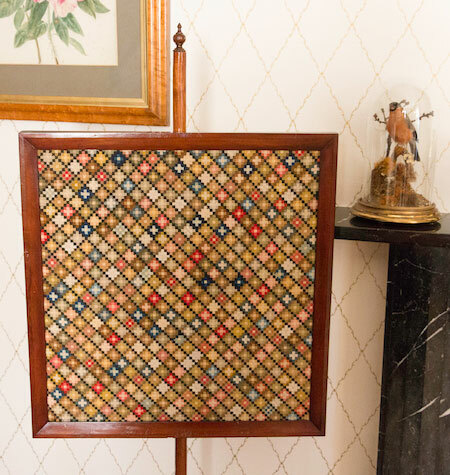 This stunning patchwork quilt was made of the tiniest fabric hexagons. They couldn’t have been more than 2cm across! It was dated from around 1890 and is now in a very fragile state as evident by the damage in the top left of the close up I took below. 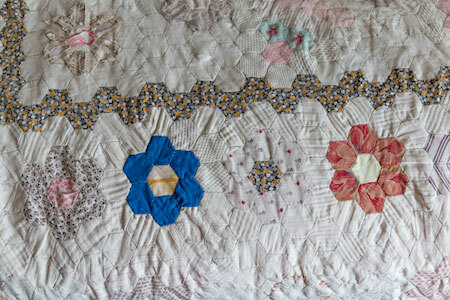 I can't begin to imagine how many hexagons there were in total in this quilt. Sticking to a geometric theme, I discovered another pole screen. These helped protect people from the heat of an open fire, and were adjustable in height. I had a feeling that the colors would have been more vivid when it was first stitched. One of the pieces I admired most was a crewelwork bedcover in the Library Bedroom (so named due to two large bookcases by the door). 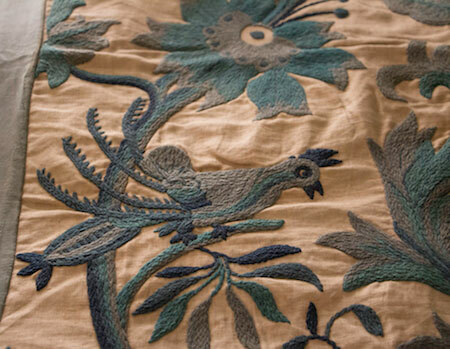 This was worked in shades of blue wool and featured fantastic birds and exotic plants and flowers. The colors had likely faded from their original giving it a rather muted, but still beautiful appearance. Upon close inspection I could see chain stitch, long and short stitch, and stem stitch used here along with French knots and many other stitches. 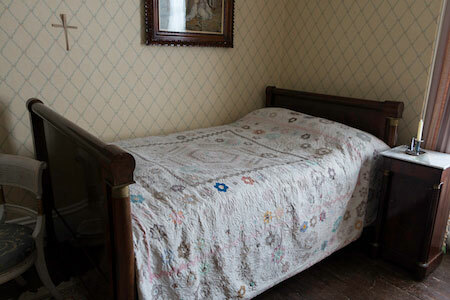 Would you believe this bedcover was found rolled up in a drawer where it had lain hidden for years? There was a note with it, stating that it was made by the maternal grandmother of Sir Francis Chichester. In the same room as the quilt, was a couch with a pile of cushions (or pillows for my American friends). The lower one in this photograph was worked from a hand colored Victorian Berlin Woolwork pattern, while the one above it was worked in silk embroidery. At the foot of this couch was a glorious chair covered entirely in needlepoint flowers. The soft hues had faded a little, but were still lovely. 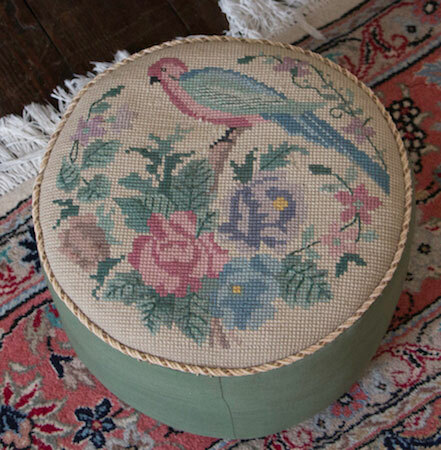 On the floor in front of the chair was a sweet needlepoint foot stool. 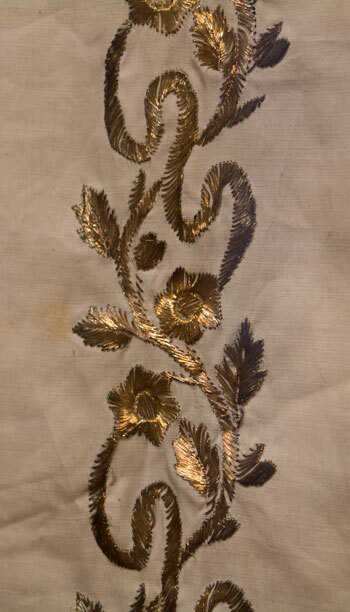 In a glass fronted display case there were two pieces of stunning goldwork embroidery. This motif on a black fabric was only a fraction of the whole item. 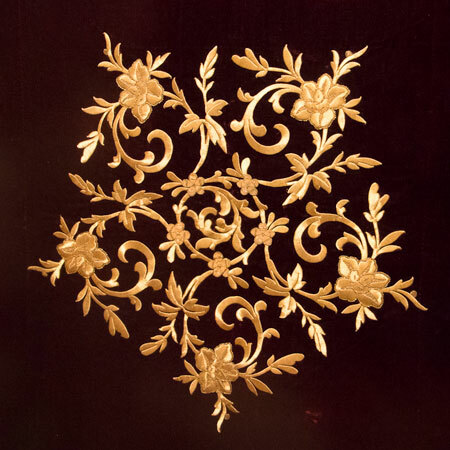 The goldwork border, below, was hanging at the back of the case and this was the best photograph I could get without getting reflections in the shot. 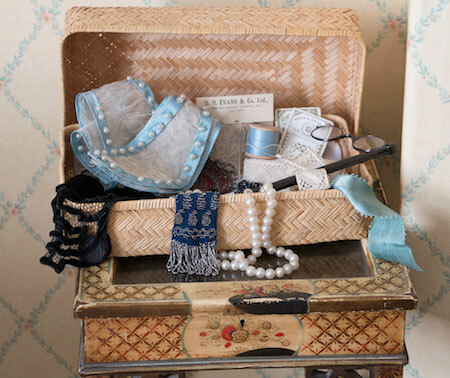 Last but not least, was a modest needlework basket, full of bits and bobs. 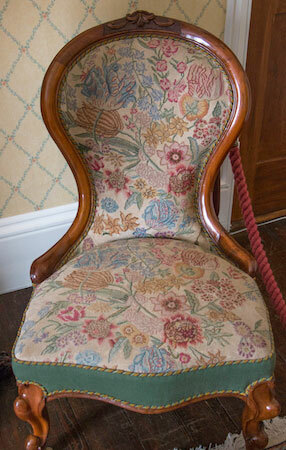 I have only mentioned the needlework related items above, but there was lots more to view in Arlington Court. Grand collections of ornamental elephants (including one made from red amber), shells from around the world and model ships and yachts were in abundance. In the grounds was the National Trust Carriage Museum, which currently hosts the golden coach from Princess Diana's wedding, a true joy to behold! Sadly photography of this exquisite carriage was not permitted. The gardens were stunning too, what a beautiful spot to end our visit. 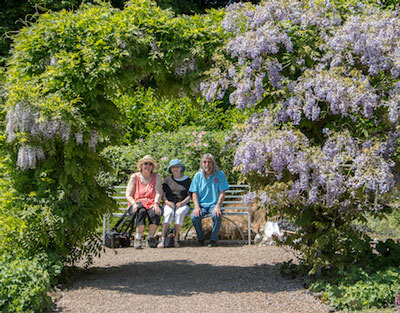 The scent of the wisteria was such a treat, I could have sat here with my mum and husband for hours. A nearby gardener kindly offered to take our photo as we rested our tired feet. I love how he framed us under the archway. Definitely a day to remember, and well worth a visit if you are ever in this area of Devon.